After too many years and too many leaks, we finally decided to have our roof replaced. The first day was "tear off" day, when a dozen guys with shovels and digging forks showed up to remove the rotten portions of our roof and put it all into the dumpster that took up a major portion of our driveway. I and our two terriers became self-evacuated refugees from the home and onto our sailboat, where we would spend the day just hanging out while Dave offered support to the crew. I should have found a way to stay--at least to witness the placing of the tarps. 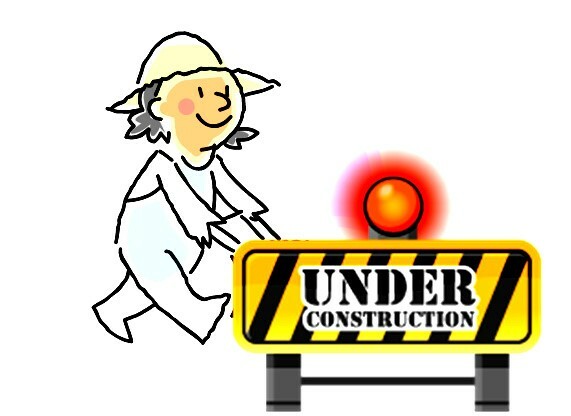 It seems that contractors who work on structures already surrounded by landscaping should go through a certain level of sensitivity training. Sensitivity toward living organisms, that is. The "before" photo taken a week before the tarp arrived. "We'll clean up any mess from the roof debris," said the boss. "Your yard will look just as good as it does before we start. Maybe even better." He went on to tell me how they had built a special box to cover one customer's prized maple tree. He made me feel confident there would be no damage. Besides, Dave knows about plants. He would be on hand to make sure it would all be okay. Me: "How are my plants?" He was obviously hiding something, so I pushed on. Me: "How are the plants closest to the house? 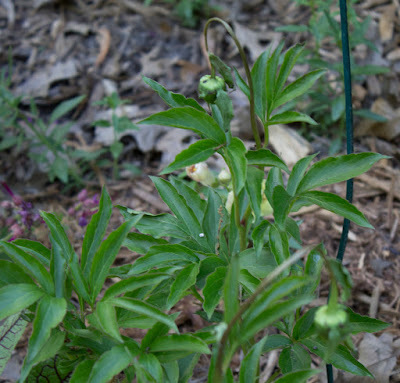 The peonies, how is 'White Cap'?" I knew avoidance when I heard it. Me: "So nothing flew off the roof and struck a plant, thereby bending/breaking/killing any stem within a half mile radius of the roof?" Dave: "No. The tarps protected them." Me: Tarps? What kind of tarps? Cloth? Lightweight? Are they touching the plants?" The day was very sunny and temperatures were in the low 80s. Plastic tarps would have the potential of literally cooking anything they touched. Dave: "Just a couple are having some difficulties." Me: "What exactly do you mean, difficulties?" Dave: "They're a little bit droopy from the weight of the tarp but they'll recover." I couldn't help but envision my entire garden laid flat, once-tall plants cowering from the threat of the evil tarp. I wanted to know more. I wanted pictures. And it was possible I wanted someone's head on a platter. I could tell he was getting a little edgy and wanted to get off the phone. Dave: "I've been trying to keep the house from catching fire, so I've been a little busy!" I pictured a roaring fire bursting through the roof faster than they could nail shingles. Me: "So, why would the house be catching on fire?" Dave: "They're using so much equipment they're blowing circuits every few minutes." I had to hand it to him for his ability to throw in that whiplash move. But I just wanted to know about my plants. All three Lilium 'Eyeliner' were burned but might still bloom. 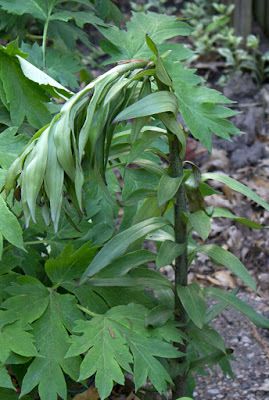 Peony 'Green Halo' was looking great but won't bloom. 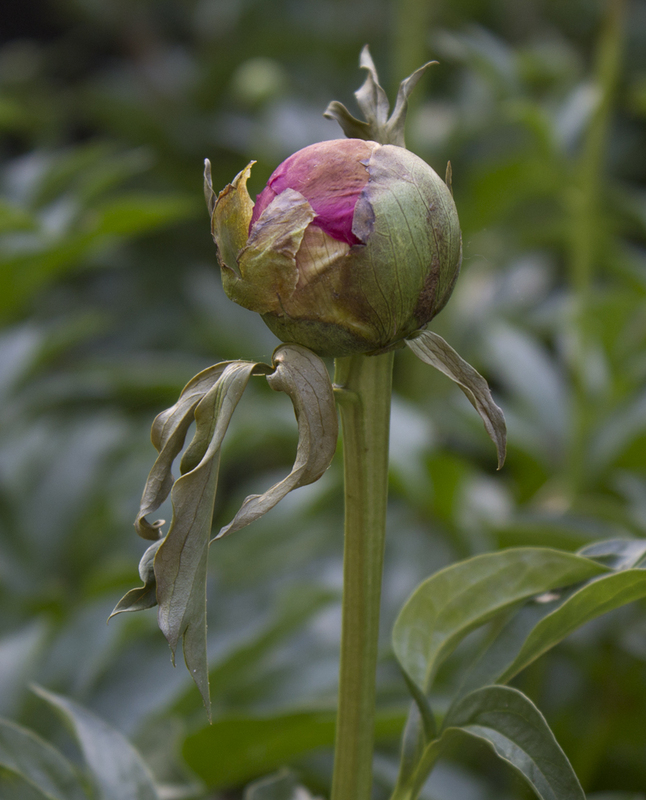 A couple dozen peony buds looked like this. 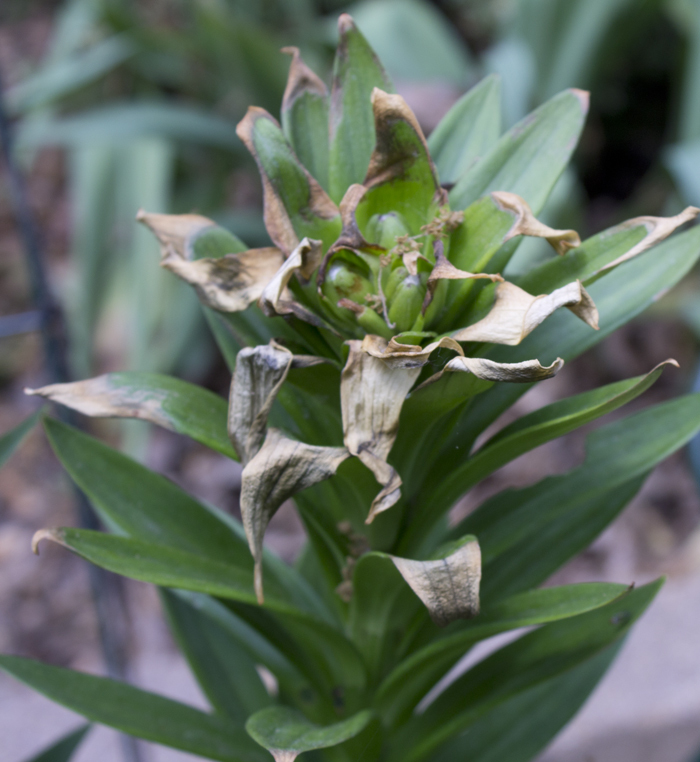 Some of the damaged plants will bloom, but won't be pretty because of the damaged foliage. The peonies that burned opened but their petals were brown. The lily that I was so excited about seeing again this year lost more than half its stem. 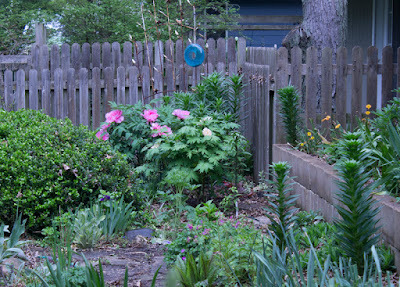 And the Hydrangea macrophylla had just been getting started before it was squashed beneath the heavy tarp. 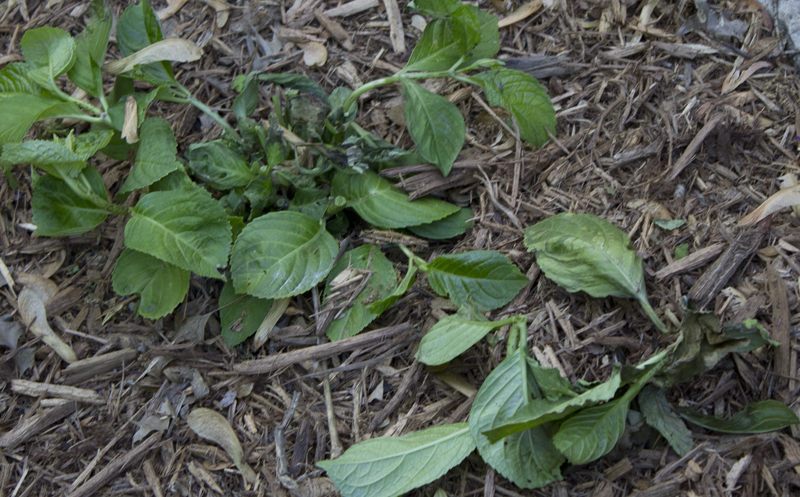 Here's what's left of a Hydrangea macrophylla. It will recover slowly. 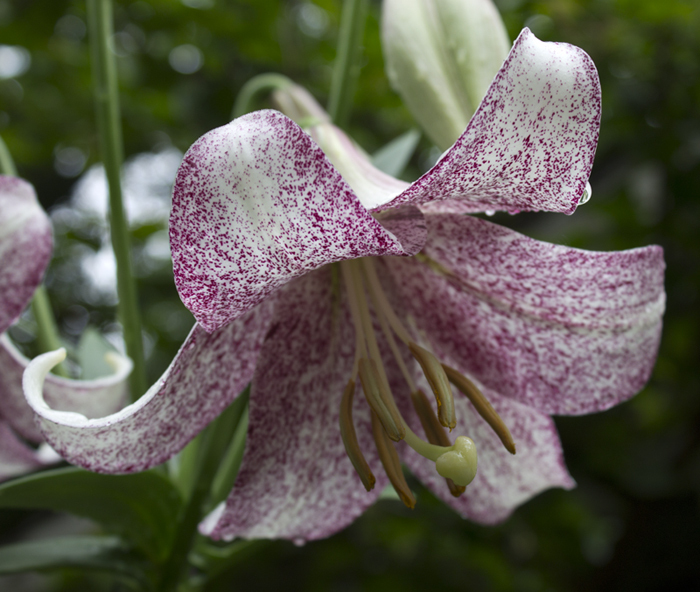 The rare Lilium 'Lankon' in its second year. I feel I should say the roof looks great. 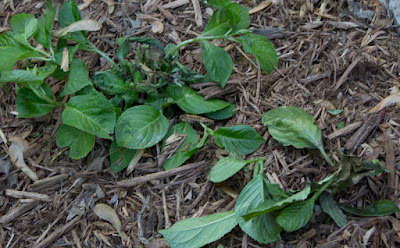 But although it's too late for some of these plants (at least for this season), I hope you will be on hand when your roofers, siders, or whoever is working on your house drags out the all-purpose tarp and drapes it over your plants for "protection." 'Lankon' (last year) might not even survive.